One of the most beautiful beaches in eastern Bali is Candidasa beach. Candidasa is a seaside town in eastern Bali that rests on the edge of a lagoon. It is popular tourist stop and is often described as a more sedate and laid back beach own beautiful beach with the black sand along the coastal and the magnificence view of the ocean. The own the fascination of the beautiful beach, thrive coconut trees, tropical atmosphere and peaceful. Tirtaganggar Water Palace is located in the district of Ubud (Karangasem), about 25 minutes from downtown. Tirtagangga water palace was built by the king of Ubud (Karangasem) in 1948. Before the palace was built, in this garden area there is a large fountain, so that the residents around this tempai called “embukan” meaning spring. The spring is enabled by the inhabitants of surrounding villages to look for drinking water and holy water. Therefore, the spring was sanctified by the surrounding population. From this springs, Karangasem’s king got the idea to establish a palace. Tirta means water that is blessed and taken from the name of the river Ganges in India. Water from the spring water Tirtaganga regarded as holy by Hindus in Bali. This water is used for religious ceremonies in temples in the area to date. These springs are needed for the ceremony organized by temples around Tirtagangga which can be reached by foot. Tirtagangga Water Palace is not huge, but it still leaves the beauty of a palace owned by the ruling king Bali. This palace has a swimming pool and swimming-pool water filled with beautiful ornaments. The complex is never closed. To be able to get into this area visitors must purchase tickets in advance and the tickets can be purchased only from 7 am to 4 pm each day.Tirtagangga Park has a cool air and beautiful scenery. The visitors are also allowed to swim in the swimming pool that is here. From Tirtagangga water palace, you can walk through a small path leading to several traditional villages located in hilly area that has beautiful natural scenery. In this area you can go on a hike to the Lempuyang temple, Kusambi hill, and Budakeling village which has a population of Buddhists. All this place has an impressive scenery and you can not enjoy elsewhere. So, Tirtagangga water palace is a tourist attraction that you must visit when you holiday in Bali. Balinese massage is part of the traditional culture and has been expanded to cater to tourists. For people who have never experienced a massage, a trip to Bali might be the ideal opportunity as prices are a fraction of what the would be in the west. •Balinese massage – A Balinese massage uses a combination of gentle stretches, acupressure and aromatherapy oils to stimulate the flow of blood, oxygen and ‘qi’ (energy) around your body, and bring deep relaxation and wellness. An ancient technique, Balinese massage uses a variety of techniques including skin rolling, kneading and stroking, acupressure and reflexology; essential oils will relax and soothe you. •Kuta / Seminyak areaMany hotels can arrange a masseuse to come to your room or have a poolside massage for a fixed price. Bali Swiss Villa in Seminyak will offer good service. It is recommended to reserve the SPA services in advance due to the high request for the SPA services. •Swedish Massage – The term “Swedish Massage” refers to a variety of techniques specifically designed to relax muscles by applying pressure to them against deeper muscles and bones, and rubbing in the same direction as the flow of blood returning to the heart. •Shiatsu massage – Shiatsu Japanese from shi, meaning finger, and atsu, meaning pressure) is a traditional Japanese hands-on therapy based on anatomical and physiological theory and is regulated as a licensed medical therapy with the Ministry of Health and Welfare in Japan. The SPA will be by the villa pool and our professional therapist will pamper you for your relaxation.These spas and the spas found in large resorts realize that decor, aroma, fresh air and tranquility lend themselves to a positive experience for the customer. The better spas will have a high level of cleanliness and offer various types of massage. Plush surroundings, tranquil atmosphere, great views / decor, quality massage. Very close to the shore, south of Sanur and close to the mouth of Benoa Harbour, is Pulau Serangan (Turtle Island). At low tide you can actually walk across to the island. Here turtles are captured and fattened in pens before being sold for village feasts. Turtles are now being protected on the west coast of Bali due to dwindling numbers and tourists are advised to refrain from eating any turtle meat or buying products made from turtles. Ogoh Ogoh monsters are colourful monster sculptures, which are made from bamboo frames and paper mache. They are made in the form of creatures of the underworld known in Balinese as buta-kala. The creatures are based on characters taken from traditional myths and legends, symbolize the evil spirits that one can encounter in life, however in modern times many also take the form of modern characters, including even people in the media or in the government. Before the Hindu new year, Nyepi, is celebrated in the spring by a day of silence (usually in March) – you can find Ogoh Ogoh *everywhere* in Bali. They are mainly built by the youngsters of the villages and kampungs in the weeks and months before Melasti and Nyepi. Many people, and specially the youth of Bali, find great fun in creating the Ogoh Ogoh, and the carnival is enjoyed by all. On the preceding day, all traffic is blocked and the Ogoh-Ogoh monsters are paraded around near the main intersections like village and cities. Finally burned in the evening to drive away evil spirits. It’s almost like carnival processions in other countries. The kids can stay up long and carry ‘their’ Ogoh Ogoh around. It’s like a beauty competition on who created the most colourful, funny or scary monster. Of course everyone is proud of their creation and the whole proceedings are very noisy and with plenty of drum sound and screaming and laughing. With its blue skies as the backdrop, Bali is a marvellous place to stage the world Kite Festival! Held in Padang, Sanur in July each year, it is attended by international kite fliers, tourists and locals alike.The Bali Kite Festival is a colourful (and free to watch) spectacle of amazing kites. The kites are launched in nearby paddy fields and because of their huge proportions, usually shaped as birds or fish, spectators are guaranteed terrific views. As most things in Bali have a purpose, the festival enables the Balinese to communicate with the Gods, asking for them to ensure good crops for the year. Do you know milk pie? If you are to Bali, do not just buy the beans as souvenirs you. But to complete the Milk Pie TypicalBali. The original Milk Pie is still homemade produced. Pie Susu (Milk Pie) is one of the typical foods from Bali. Pie Susu are very enthused with the image of a typical milk taste and sweet, with the simple design. But there is awesome taste melt at your tongue. Pies milk has the form of wide, thin, and about 7 inches in diameter, the skin was crispy and the center very soft. Although made ​​from eggs and milk there is no fishy taste, suitable as a tea or a snack for the family. If you visited on Bali, don't forget to gift your beloved with Wood Carving. You can easy to getting on Mas village. This village produce very good quality of wood carving made from very hard wood such as teak, mahogany, ebony, and hibiscus wood. all the wood imported from Java, Sumatra, Sulawesi and Borneo (Kalimantan). It owns the typical style of wood carving art by placing forward the distinguish synergy the humanism and naturalism. The village's popularity as an art village is famous in the national and world level which is not forgetting from the highness name of some maestros which has borne and found the spirit (taksu) and soul. Many couples are waiting for February 14th , Valentine’s Day 2012 with great expectation this year. Whether its your very first Valentine’s Day as a couple or you have been together for decades, this holiday of love is very special indeed and many of you are looking for some tips and advice on how to make it extra awesome. Chocolates are, of course, the ultimate gift idea for Valentine’s Day. You can buy and place them in beautiful golden wired gift baskets and can even present them to friends, family or even your business clients (if you happen to be in an appropriate industry). You can also present them to your lady love in a heart-shaped box. It is the most delightful gift which conveys your love most appropriately and delightfully. Flowers have always been in vogue on this romantic event for your friend with sign of your friendly flowers. This gift would pass on the perfect message to your pattern. A romantic candle lit dinner can also be the ideal way of proclaiming your love on Valentine’s Day and a cool way of celebrating the day with the one you love. A getaway on this special day would also thrill the love of your life. A quiet and private Valentine’s Day 2012 spent at a romantic spot far away from the city where you will not be disturbed by anyone could win your lady’s heart forever. The private quiet with stay at villa with private pool. You can visited on Bali Swiss Villa or Grand Bali Mulia Vila. On there you can getting Honeymoon packages with more advantages. 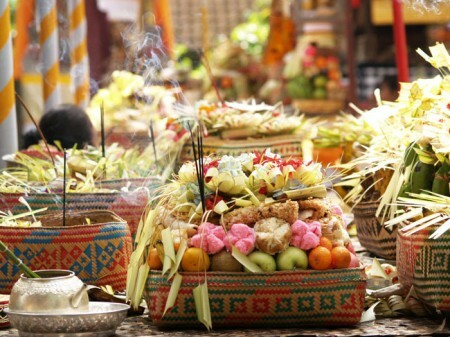 Every temple in Bali has a regularly scheduled festival, an odalan, to celebrate the anniversary of temple dedication. The Odalan are scheduled either by the lunar calendar, the Saka Calendar, or by the 210-day ceremonial cycle, the Pawukon calendar. The latter consist of 30 weeks, each seven days long. Most odalans are set by the Pawukon calendar, some temple fix their odalans according to lunar calendar or the Saka Calendar. Usually an odalan takes place at either full or new moon, more likely full than new. On specially at seminyak, there are 3 temple on there. Most odalan last for three days, although some go on for more than a week especially for odalan that is set by the lunar calendar or the Saka Calendar and a few last only one day. The odalan usually begins late in the afternoon and last until very late at night or even into the morning hours. The ceremonies vary so much from village to village that it is impossible to state exactly the details of an odalan but there are many common features, and it is impossible to draw a useful composite picture. Odalan, like all Balinese ceremonies, is never solemn. Every one chats, jokes, and laugh, children run around delighting in the festive atmosphere. It is a joyous occasion. A group of older man recites traditional poetry in ancient language. This recitation called Makekawin. After one man reads a phrase in a singsong fashion, another translates into the vernacular so interested bystanders can understand. Women come and put down their offerings in a small open pavilion (bale) and make last-minute adjustment. The men remove their sandals and then sit cross-legged (masila) on them on the ground. The women rejoin their families on the ground, kneeling (matimpuh) rather than sitting. Each worshipper puts a canang on the ground in front of where he or she is seated, and then places a stick of smoking incense on the top of the canang or sticks it into the ground nearby, ready for the prayers. Meanwhile, seated in the center on a mat, one or several man or woman clad all in white are praying fervently, each ringing a bronze bell with his or her left hand and occasionally flipping flowers toward the offerings filled in front of them. Sandalwood brazier in the smolder nearby and its fragrant smoke mixes with incense that fills the air above the worshippers. Periodically each man takes a small basket and wafts the essence of the offerings and the smoke toward the deities. These are the lay priests, the pemangkus, who have direct charge of temple affairs. Their prayers present the offerings themselves to the focus of the ceremony, the God. The act of prayer of the worshipper consists of grasping a flower from the canang between the middle fingers, palms together, thumbs against forehead. The temple priest leads the prayers; there are five separated prayers, the first prayer is without flower dedicated to purify the mind of the respective worshiper. The second prayer usually uses red flower, is dedicated to Sun God (Bhatara Surya), asking him to witness the prayer. The third prayer usually uses a fan shape offering, called kwangen, can be substituted with flower and money if it is not available, this prayer is dedicated to the God which resides in that temple. The fourth prayer also uses kwangen or flower and money if it is not available; this prayer is dedicated to the God Almighty, Ida Sanghyang Widhi. The fifth prayer uses no flower; this prayer is dedicated to show our gratitude to the God Almighty, Ida Sanghyang Widhi. After the prayers, the pemangku comes around with holy water. The worshipper holds out his hands, takes the holy water into his right palm three times and sips it. The fourth and fifth pouring is spread over face and hair. After a final sprinkling from the pemangku, the prayers are over. The pemangku passes around some sticky rice (bija) and the worshipper presses a bit of it onto his forehead. A small amount of this rice is also eaten. The worshipper now arise, put on their sandals, take up their offering and leave to go home, but most of them are stay in the middle and outer courtyard of the temple. There is much socializing here as neighbors visit, admire each other’s children, and discuss village affairs. Later on at night there is generally some wali, entertainment arranged in the form of a drama, arja opera or shadow puppet play that may last till the early hours of the morning.